One of the world’s oldest surviving wooden artefacts is a yew spear head, found in 1911 at Clacton-on-sea, Essex. It is estimated to be 450,000 years old. Yew wood is reddish brown (with whiter sapwood), and is very springy; the entire tree is poisonous – wood, bark, needles and seed. It was traditionally used to make bows, especially the longbow: the battle of Agincourt was considered to have been won by the yew wood long bow. Yews are fascinating trees – characteristically planted in churchyards, where some are estimated to be over 1,000 years old. The Druids regarded yew as sacred and planted it close to their temples. As early Christians often built their churches on these sacred sites, the association of yew trees with churchyards was perpetuated. Another theory is that they were planted, for making bows, in graveyards so that they wouldn’t poison grazing cattle. Very slow growing for a conifer, yew is one of the hardest of the softwoods. Much prized in furniture making for its colour, figure and durability, it is also notoriously hard to work: deceptively smooth, the grain is interlocking and will often ’catch’ a tool edge – cabinet scrapers and sandpaper are traditionally used for finishing yew wood pieces. It also makes spectacularly beautiful turned objects or treen. The earliest [and the best] Antique Windsor chairs, were made with yew – it was well suited to being steam ‘bent’ for the characteristic bow back, as well as being turned for the spindles. The patina of yew wood is unique, and particularly lovely – over the years it develops a silky sheen. Similarly the colour, while really quite vivid orange with purplish streaks when freshly cut, fades to a warm, mellow brown on antique furniture. It is one of the most prized, and unusual, of our indigenous cabinet timbers. 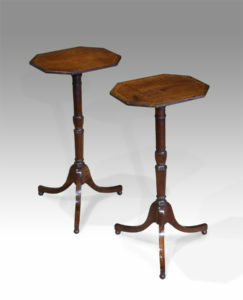 This exceptional pair of Georgian yew wood lamp tables are a fine example, with their elegant turned columns and octagonal tops with fine inlay. 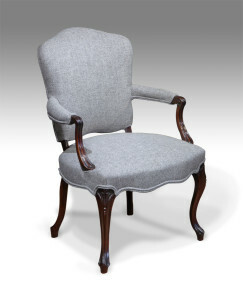 As a furniture style, Regency has come to embrace a period from the 1790s to about 1830. Strictly, Regency means 1811-1820 which was the period the Prince of Wales (later George IV) acted as Regent during his father’s period of insanity. The Prince presided over the rebuilding of much of central London, with possibly his most impressive achievement being Carlton House – Regency high style at its most sumptuous. The major source of inspiration for Regency taste was found in Greek and Roman antiquity. A taste for Egyptian motifs, resulting from the Napoleonic expeditions to Egypt, also became part of the Regency fashion. Variations in the Regency period also produced a resurgence of the Chinese theme seen in imitation bamboo and in painted and “japanned” black and gold lacquer pieces, most notably at Brighton Pavilion – George Smith (1756-1826) and Thomas Hope (1769-1831) both designed furniture for the Royal Pavilion. Classical proportions and elegant design have combined to make this one of the most admired periods of English furniture making. Another important Regency personality was Nelson (1758-1805). Admiral Nelson’s much publicized victories at sea had a powerful effect on English Regency furniture design. Ebony was used to decorate furniture as a sign of mourning, and some chairs were carved in imitation of Nelson’s draped sarcophagus. Seafaring motifs abounded, their best-known use is on Sheraton’s ‘Nelson chair’, or ‘Trafalgar Chair’, which has decorations of carved dolphins, anchors and rope on the splat. The wood used for furniture during the Regency period was often mahogany, either solid or veneered. Rosewood became very fashionable wood for cabinetwork after 1800, and many Regency pieces were made entirely of it. Other exotic wood such as ebony and zebra wood were used combined with brass inlays. Brass inlays were cut from brass sheets and were frequently inlaid as narrow banding and stringing lines into rosewood and mahogany furniture; such as on this impressive centre table. Antique furniture is cheaper, in real terms, than it has been since the 1990s – most pieces have stayed roughly the same price for the last 15 years, while some, such as sets of dining chairs and the larger bits like tallboys and sideboards, have come well down in price. 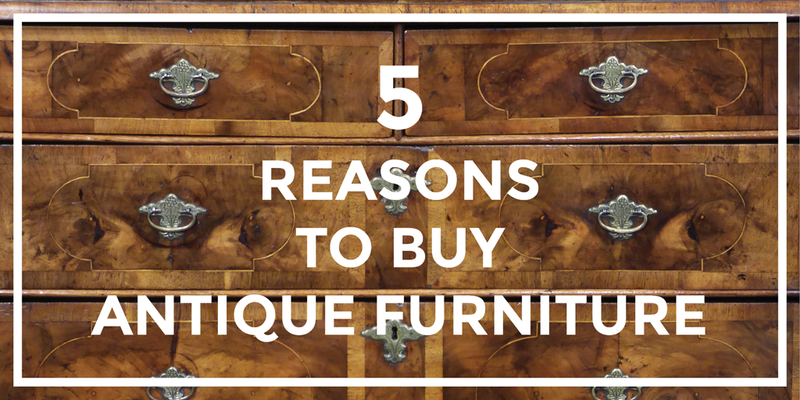 Antique furniture has generally been undervalued in relation to other arts, so if you’re buying something you love that is in good condition, the chances are it will be a good investment. A modern piece of furniture is worth next to nothing by the time you get it home. Machine tools as we know them were not really developed until the second half of the 19th century, so all furniture was made by hand by highly skilled cabinetmakers. Apprenticeships were 7 years – not surprising when you consider the level of skills necessary. Examine the dovetails on the little drawers on ANY Georgian toilet mirror, and you will find the finest ‘pins and ‘tails’, cut to needle point precision with a fine saw. Beautifully made and built to last. The trouble with buying ‘shabby chic’ or whatever the latest trend is … exactly that! It is the latest fashion, and a soon as things move on you’re left with an outdated ‘look’. Georgian furniture, in particular, has a classical timeless elegance. Its simplicity of design goes so well in contemporary settings, and never dates. Buying antiques is the ultimate in re-using and re-cycling. In September 2010 a carbon footprint analysis was commissioned of an antique chest of drawers against its modern equivalent. The study, conducted by Carbon Clear, an independent consultancy specialising in carbon accounting, finally puts a figure on just how eco-friendly buying antiques can be: the new item had a carbon footprint 16 times higher than the antique! 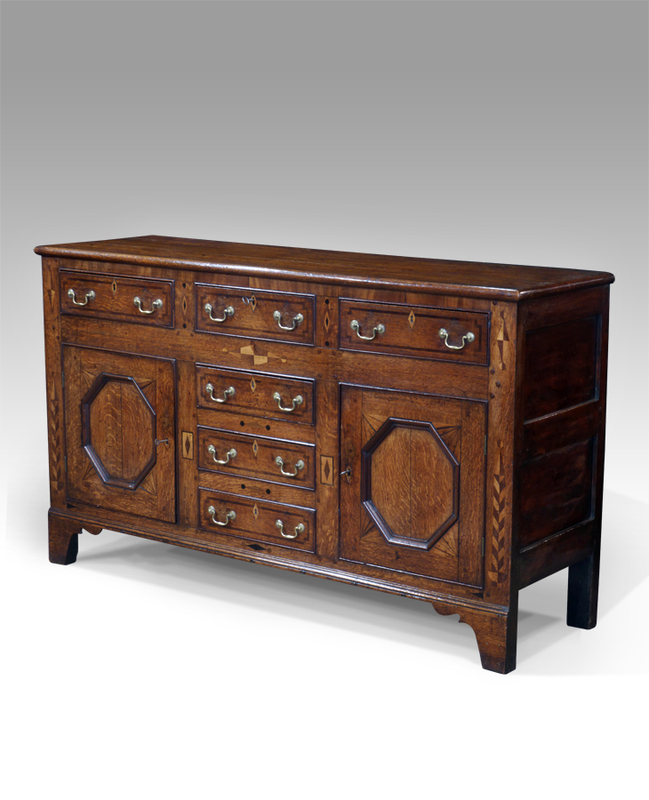 The analysis compared the greenhouse gas emissions produced during the lifespan of two chests of drawers; one constructed in 1830 with an assumed lifespan of 195 years, during which time it has been restored and sold twice and, the other, a new piece of similar value available from a reputable high street retailer with an assumed lifespan of 15 years. Create your home, not a show home. One of the great things about buying antiques is you are never going to spot that exact same piece in somebody else’s house! Contemporary eclectic style mixes antique with 20th century and modern for your own unique look. English Oak – Run of the Mill? English oak is a beautiful wood; it tends to have a fine and close grain, and hardens with age to an iron-like strength. England’s generally rich soil and its comparatively mild and moist climate have provided it with an abundance of trees ideal for use as timber. Medullary rays are a particularly characteristic feature of oak, winding across the grain, usually paler than the surrounding wood. These are small bands of cells which conveyed and stored nutrients horizontally. In England, well into the 19th century, the commonest method of converting timber into planks was by means of a long saw with a handle at each end, worked by two men, one of whom would often be standing below the log in a pit. Such timber is known as “pit-sawn”, and the unfinished back or interior boards of many a piece of furniture show its distinctive parallel saw marks. The most obvious method of converting a log into planks is simply to slice it into parallel layers; This is known as plain sawing, and gave rise to the expression “run of the mill”. In order to produce planks with the sought-after medullary figure, the log would be “quarter-cut”: it was first divided lengthwise into quarters, then planks were sawn from each quarter. Boards created this way are also less likely to warp, and were used as show wood. 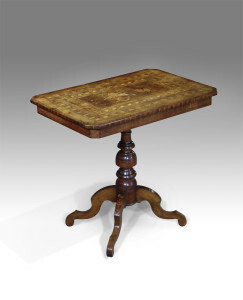 One of the more unusual pieces that we have had in recently is this 19th century north Italian walnut occasional table. It has an oblong top, with canted corners, and decorative parquetry inlay, with a central marquetry motif depicting a classical chariot scene. Raised on a turned column, it has three hipped, scrolled legs. Marquetry was introduced into English furniture at the restoration of Charles II in 1660 by Dutch immigrant “inlayers”. At the end of the 17th Century, a new influx of French Huguenot craftsmen, known as “ebenistes”, popularised seaweed or “arabesque” marquetry. 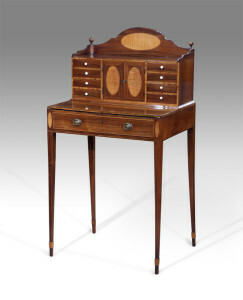 The technique was revived again around 1765, when formal neo-classical designs became popular in Adam and Sheraton style furniture, and remained in use right into the late 19th century. How do I know that the piece of furniture I am looking at is a genuine antique? Could it be a reproduction or a fake – and what are the things to look for? 1. First, look for anything that shouldn’t be there; are the top, back or sides made of plywood? 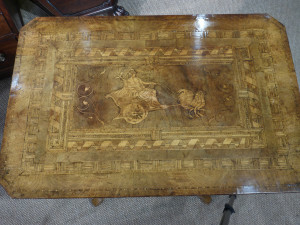 Plywood was not used in furniture making until the 1930s, so would never have been incorporated into a Georgian piece. Similarly, chipboard, staples or Phillips screws are evidence of later construction. Antique chairs were always made with mortice and tenon joints, so a Georgian chair jointed by dowels is not Georgian! 2. The next thing to do is turn the piece upside down [where possible!]. If it is a large table, such as a diner, I often advise people to take a torch to have a good look underneath. The first thing to look for is almost part of the ‘patina’ of the top: if a table has been used for two hundred years or so there will be a waxy rim around the under edge where people’s fingers have touched the table. This is near impossible to reproduce – if the underside is too clean, or there are stain brush marks, steer clear. 3. If the piece is veneered, as a general guide, the thicker the veneer the older the piece is. Veneers were handsawn until well into the 19th century, so were by necessity coarsely cut. They were glued down [always with ‘Scotch’, or animal glue] and then sanded and polished in situ. Veneers became thinner and thinner as mechanisation increased, and by the 20th century they were literally ‘paper’ thin. 4. Dates are important when looking at screws and nails. Screws as we know them were not introduced until around 1675 and were handmade well into the mid 19th century. A handmade screw has little or no taper, the slot on the head is very rarely centrally aligned and the handmade screw has a much shallower spiral than the machine made variety. Nails were square cut, with round wire nails not used until about 1900. 5. Finally, run your hand over the table top: a new top will have a new finish, and will not be smooth and silky to the touch as with original patination; the grain may be raised, or the edges oddly sharp for a piece of age. As with all areas of antique buying, this is where experience counts; but follow your instincts: a piece that simply ‘feels’ wrong often is, and gradually your eye will become tuned in. Before it became Britain’s number one drink, China tea was introduced in the coffeehouses of London shortly before the Stuart Restoration in 1660. Between 1720 and 1750 the imports of tea to Britain, through the British East India Company, more than quadrupled. Tea became a hugely popular drink in Britain, but, to the ordinary consumer, it was also hugely expensive. The monopoly on imports held by the merchants of the East India Company meant that tea prices were kept artificially high to protect profits, and on top of this government imposed a high level of duty. Tea was not only fashionable, it was also valuable, and fine items such as tea caddies were made for storage and display. The ultimate tea caddy was its own piece of furniture: a teapoy. They were developed in the mid 18th century, first in India, and then by British cabinet makers. The name, strangely, derives not from the word “tea”, but from the Hindi phrase meaning “three footed”. They usually took the form of a small pedestal table equipped with a box attached to a tripod base. The box was a fitted inside as a tea caddy, used for storing loose tea; if it was flat-topped, the teapoy could also serve as a small tea table. This particularly elegant example dates from about 1835. It is veneered in beautifully figured mahogany, with the original fitted interior consisting of four canisters and two glass bowls for storing and mixing tea. Raised on a turned column with acanthus leaf baluster and gadrooned collar, it has a quad form base with Tudor rose mouldings and bun feet on castors. 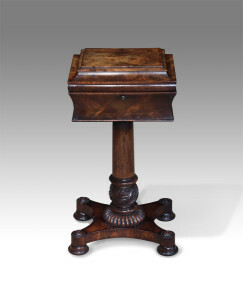 This beautiful little ladies writing table is known as a ‘Bonheur du Jour’ meaning “daytime delight” in French! They were introduced in Paris in the 1760s, and swiftly became fashionable. The Bonheur du Jour is always very light and graceful; its special characteristic is a raised back, which may form a little cabinet or a nest of drawers, or open shelves. This, an English version, is very finely made in Kingwood. Sometimes known as ‘violet wood’ because if its slightly purple hue, Kingwood [Dalbergia Ciarensis] is an exotic hardwood originating from South America. It is a small diameter tree, so although the timber is strong and straight-grained, it was mainly used as a decorative veneer. Described in some early inventories as ‘Prince’s wood’ it was prized for its colouring and distinctive, stripy grain. First used by the French cabinet makers, or ‘ebenistes’, of the Louis XIV period, it was very popular; often used in conjunction with Tulipwood, another decorative hardwood with a distinctive pink and cream stripe, many of the grand, ormulu-mounted commodes of the day were quarter veneered with these. Imported from such a long way, and only in small quantities, it would have been an expensive veneer. In England it became popular during the Sheraton period of the late 18th century, often used as a decorative crossbanding with other exotic hardwoods, such as Satinwood and Purpleheart. It remained in occasional use throughout the Regency period, although Rosewood, to which it looks very similar, was more popular. 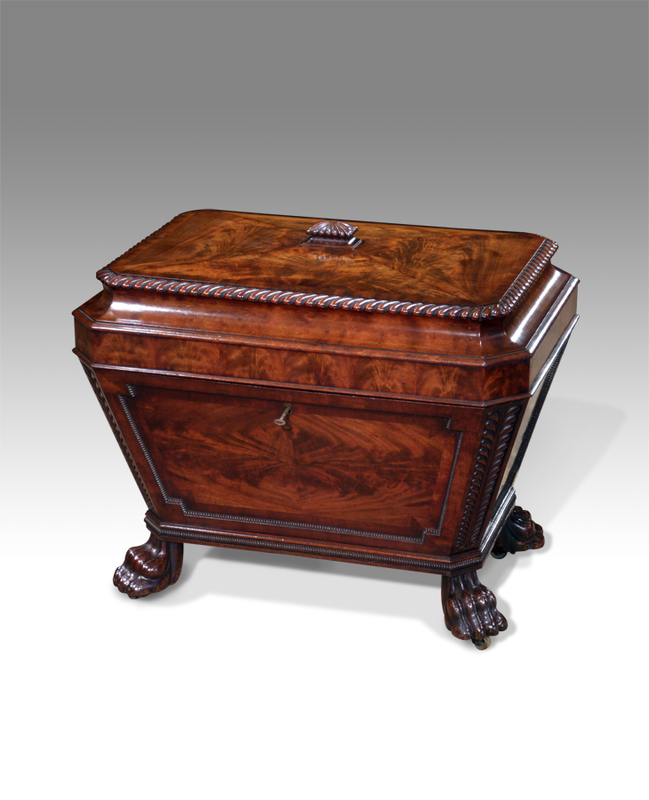 One of the most exceptional pieces we’ve had in recent months is this wonderful Georgian mahogany wine cooler that has just come in to the showroom. It is a classic piece of English cabinet work from the late Regency period – some might claim the peak era of furniture design. Pieces from this date were beautifully executed, with all the skills and knowledge of previous generations of craftsmen put to good use. The mechanisation of the subsequent Victorian period heralded the advent of mass production with a subsequent homogenisation of design innovation. Of ‘sarcophagus’ design, this wine cooler is in wonderful original condition. Robert Adam wrote that the English were “accustomed by habit, or induced by the nature of our climate, to indulge more largely in the enjoyment of the bottle” than the French. Perhaps this explains the huge diversity, during the 18th century, of types of containers made for bottles – intended to stand in the dining room, generally under a serving table or sideboard. By the early 19th century there were even cabinet makers who specialised in making nothing else. The terms “cellaret” and “wine cooler” are sometimes not used with any clear distinction, but generally the former had a lid and was used for storing bottles, while the wine cooler, open or closed, was lined and filled with ice for cooling them. This example has never had a liner. It features beautifully figured flame mahogany panels veneered [as in all the top quality pieces] onto straight grained mahogany. Turned “gadrooning” frame the panelled sides and the whole rests on magnificently carved “lion’s paw” feet. What Counts is Underneath the Upholstery! A piece such as this beautiful French “fauteuil”, or arm chair, dating from about 1790, has a solid frame constructed of beech. Each joint is handmade, and the frame skilfully shaped to support the upholstery. 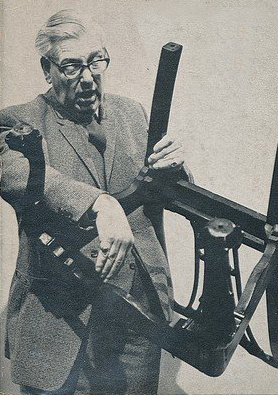 Modern furniture makers talk about “ergonomics” – the 18th century craftsmen were already practising it! All our upholstered pieces here at Thakeham Furniture are stripped back to the frame in the workshop, so that we can check for any loose joints, and treat for woodworm if necessary. They are then dispatched to our master upholsterer Louis, who has over 50 years’ experience in the business! He uses all traditional materials, such as tacks and horsehair rather than foam and staples, so the upholstery will last for years. We choose only the best quality fabrics – this is a lovely grey wool tweed supplied by the Isle of Mull weavers Ardalanish. It gives a contemporary feel to the chair, while complimenting its colour and form.